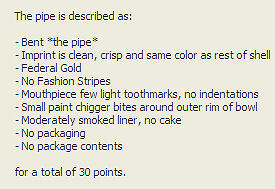 The value of pipe #508 is 30 points. Vincent Walker (umblessedone) held an exciting auction on eBay for nine pipes, seven the pipe, one Venturi, and another pipe. All of the pipes were in excellent condition, although some of them may have been repainted and some have replacement mouthpieces. The other pipe will, as usual, be sold on eBay at some time, probably with some other odds and ends garnered from lots of pipes that included some I wanted. The Venturi is no improvement to the collection and it will be added to the Pipes for Sale page. This pipe will be added to the Pipes for Trade page. Steve Ciesicki bought it for a friend to try one out.